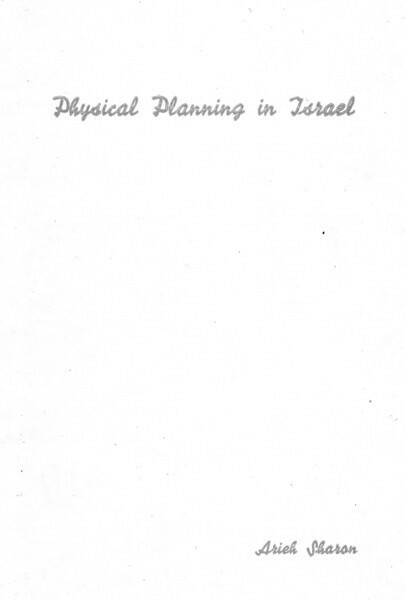 This section of the Archive is dedicated to "Physical Planning in Israel" - the first overall plan for the State of Israel - an effort that was headed by Sharon in the years 1948 through 1953. This section is based on a book by the same name published in 1951. The book was published in Hebrew with an English translation, as a booklet, inserted into an internal sleeve. The maps, drawings and photos are from the original Hebrew book. The text images and the texts associated with maps, drawings and photos are from the English booklet. The credits at the end of the English booklet: "Edited by the Government Printer. Printed by Government Printing Press and Survey of Israel Press. Basic maps and Offset printing - Survey of Israel. English Supplement - Kfar Monash Printing Press. Photos - Government Public Information Office, Kalter, Kluger, Prior. Blocks - United Zincographies Limited." The appendices at the end of the section contain documents, letters and photos from this period.